Japan has rolled a red carpet for Indian immigrants who are planning to make a short or long visit to their desired destination. It is said that they are going to ease prerequisites for granting multiple-entry visas for those who are in a plan of visiting Japan after 11 January 2016. This new plan has been put forth after India’s 'visa on arrival' promulgation to Japanese citizens from 1 March 2016. As per the new visa regulation, an overseas applicant is permitted to stay for a maximum duration of 30 days from the existing 15 days, and these are valid for up to five years from a minimum of three days, said the Japanese Foreign Ministry. 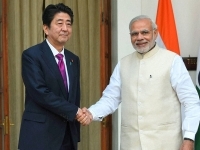 The new move has come into force after Prime Minister Narendra Modi and his counterpart Shinzo Abe conference on Saturday on people-to-people exchange promotion, said the sources. On the announcement of Modi’s visa on arrival plan, the overseas ministry has also disclosed a new plan of extended the stay period for Indians visiting on multiple-entry visas for commercial works. Multiple-entry visas that are valid for a period of five years and now extended to 10 years, according to the concerned sources.